one of those players is here in Southwest Florida, but her journey began in Bulgaria. 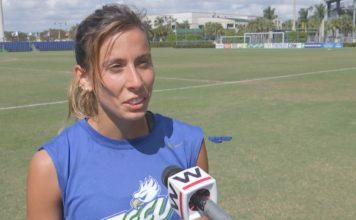 “I came here with goals and obviously that’s my job as a striker to score every single game and I think I’ve been doing well so far but I want to score even more,” said Florida Gulf Coast’s Women’s Soccer’s Junior Forward Evdokia Popadinova. Popadinova is used to announcers struggling with her Bulgarian name. It’s a name anyone announcing FGCU Women’s Soccer game has to say frequently this season, since Popadinova leads the team in scoring, and joined just six players nationally with 10 or more goals this season when she scored twice in the Eagles Friday win over North Alabama. That means FGCU is now 9-0 when Popadinova scores. She said she transferred to the program to win championships, but Southwest Florida has other perks. “Well I don’t want to say it was only the weather. FGCU is obviously a higher level because it’s NCAA Division I and that was my main goal to just go to the next level but since the weather is so good it just benefits me even more,” said Popadinova.